More than 6,000 faculty and staff participated in the UBC Workplace Experiences Survey in November 2017. What’s happened since then? 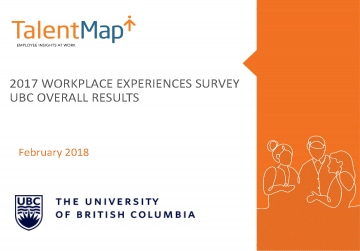 Together with our survey partner, TalentMap, Human Resources presented the survey results at open sessions in Vancouver (February 7) and the Okanagan (February 8). The overall results are available below. All eligible units (those with 10 or more survey respondents) received their unit-level reports (February 15). Units were encouraged to connect with their Human Resources Advisor before making requests for additional data cuts. Additional data cuts can be helpful in further understanding specific themes. For example, you may wish to see if experiences related to professional growth may differ in your unit according to a demographic such as length of service. Learn more about working with your results here. The overall result for faculty and staff are available here (PDF). Download the overall WES highlights as a one-page infographic (PDF). Over 6,000 faculty and staff participated – a 9% increase since the previous survey! Key drivers of faculty engagement are professional growth, UBC’s senior leadership and student focus. Key drives of staff engagement are professional growth, inclusion & respect, and UBC’s senior leadership. As we continue to share and reflect on the results of the survey, we have found some interesting and surprising findings! Faculty are less likely to participate in the Workplace Experience Surveys therefore the results are not representative of their experiences. Overall response rates were 47% for staff and 27% for faculty. Further analysis revealed that 46% of tenure-stream faculty participated in the WES; this is on-par with the staff response rate. The WES results are broad and therefore not relevant to specific experiences within a specific unit. About 250 faculties, departments, and units received unit-level reports to help identify priority areas and inform their strategic planning efforts; every Faculty and mid-sized unit in Vancouver received a report. Units with less than 10 responses were bundled into the next appropriate report. 14 units across UBC had response rates of 80% or higher. UBC is partnering with third-party survey consultant TalentMap to administer the survey and analyze the survey data. TalentMap has helped numerous organizations across North America measure and manage employee engagement and workplace intelligence to create positive organizational change. TalentMap is based in Ottawa, Canada.